Finished Size: 2.125" x 5.5"
5,000 and under Tickets: Ships or ready for pick up in 2 business days from proof approval. Over 5,000 Tickets: Ships or ready for pick up in 5 business days from proof approval. Full-color ticket printing - boost interest in your next event! 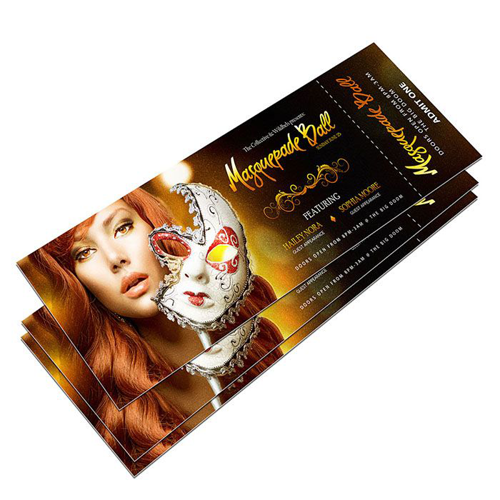 Full-color event tickets printing can get people charged up about your event! Our professional ticket printing service is a great value for large scale concerts, theatrical performances and professional or college sporting events, as well as small scale events such as community plays, school dances or proms, raffles, and fundraisers. Use ticket printing to promote your brand and the event itself, advertise your website and contact information, and display compelling graphics and photos that make people eager to attend your event. At 48HourPrint.com we also number your tickets! Preserving the environment is important to 48HourPrint.com. Our tickets are printed on recycled cover stock, which delivers excellent ticket printing results on stock that is brighter and more uniform in color. Recycled cover stock is our standard stock, at no extra cost to you. Tickets are printed in full color on both sides on 14 point cover stock, with your choice of matte coating, gloss coating, high-gloss U.V. coating, or C1S (coating on one side). For promotional tips on using tickets, check out our ticket marketing ideas. Also review our ticket templates for layout guidelines that will help keep your print job on schedule.